It was damp and misty and mild when I left Spitalfields early this morning to pay a call upon Stuart Crump, his daughter Alice, and Curly who works with them on their stall. A man of substance yet a relative newcomer to the market, Stuart has been in Columbia Rd for ten years and worked this pitch for the past two or three years. “My mum was a lecturer in floristry at the college in Southwark,” he explained proudly, “so when I left school in 1994, I opened a flower shop in Tottenham and then I had a place in the Edgware Rd, before I came here.” Stuart flies to Holland every Tuesday where he spends two days of each week buying plants for the coming Sunday at the huge auctions in the West Land. This week, Stuart has a fine selection of Orchids at competitive prices, and Chilli plants and Cyclamen are popular too. At this point, Stuart’s enthusiastic daughter Alice bounced into the conversation to explain that she takes responsibility for rousing her father from his bed each Sunday at three-thirty in the morning, which caused Stuart to place his arm round her protectively as he rolled his eyes at the very thought of these reluctant awakenings. 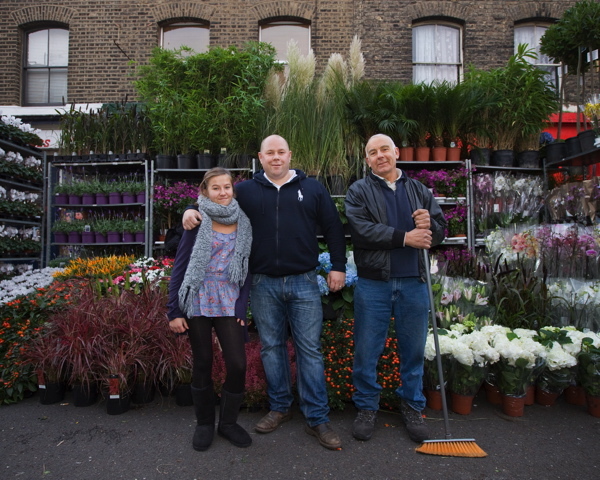 Alice takes great delight in the market, working here alongside her brother Charlie most weeks, and she is eager to follow her father into the family business, even though Stuart is dubious of the imminent changes coming to Columbia Rd. Stuart told me the stalls will be widened to twice the breadth and separated. “It won’t be good for the market, people like the hustle and bustle, and we haven’t got the stock to fill the width.” he confided with a shrug.